Better quality of sleep can be achieved by decreased amount of stress. The interplay between stress and sleep will be studied to understand how stress may lead to disturbances in sleep due to physiological changes. It is important to study this relationship because stress may induce negative effects on sleep, such that it produces physiological activation (i.e. increased cortisol levels), which can conflict with physiological deactivation in sleep. This may lead to stress induced sleeping disorders such as insomnia. For example, when a person is under a lot of pressure, such as that he is sleeping the night before a big exam, his sleep efficiency and the amount of time spend in deep sleep are both decreased due to stressfulness . Moreover, the disturbance of sleep by stress may lead to other diseases such as cardiovascular diseases, obesity, diabetes, hormone regulation, and immune system regulation. On the contrary, the importance of sleep on alleviating the symptoms of stress is evident when the body attempts to moderate the stress-immune relationship. Researchers have found that sleep can be a mediator of the stress-immune relationship. Thus, the more stressful people are, the lower the number of circulating natural killing cells, and the greater the time spent awake during non-REM sleep period. Moreover, a good amount of sleep may increase neurogenesis. Therefore, get a good night undisturbed sleep is the number one key step toward reducing stress. 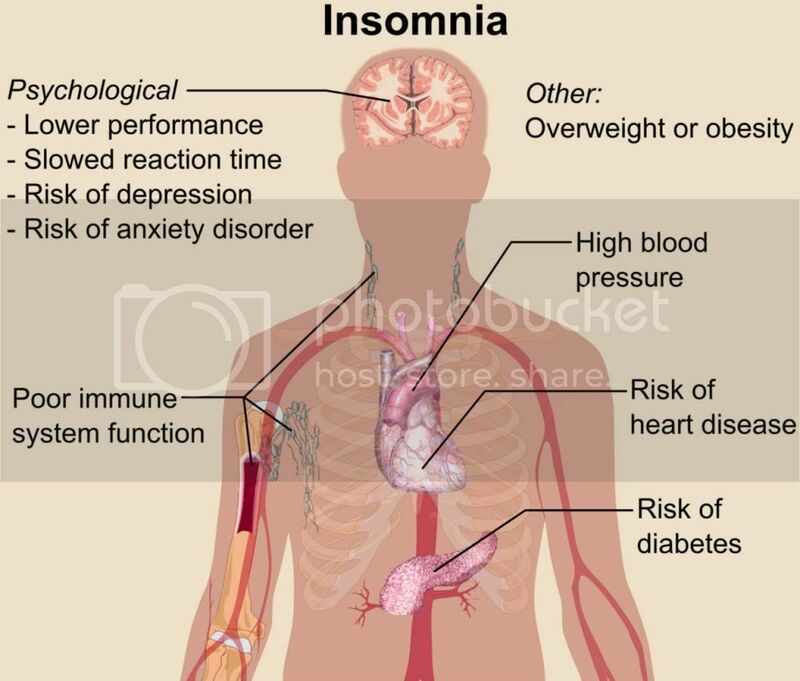 Insomnia is defined as having difficulties in sleeping for at least 3 months. Stress is considered the primary cause of insomnia . Patients with insomnia also tend to have elevated cortisol levels and heart rate, which will be discussed in a later section; these changes indicate the increase in overall oxygen use in insomnia patients  . One study showed that insomniacs reported the impact of daily minor stressors and intensive major negative life events are high on their everyday life, they thus perceived their life as more stressful . These psychological stress events are observed to induce an increase in oxidizing substances in body, in which trigger oxidative stress by causing imbalance between oxidant production and antioxidant defences . Sleep, on the other hand, will play an important role in enhancing antioxidant defense system. In another study by Abe and others, the characteristics of behaviors for coping with stress and sleep hygiene were examined on adults with Insomnia. Stressful life events such as divorce or pain may precipitate insomnia . If people are inadequate in coping with stress, they may also experience the negative effects of insomnia, or unable to get a good night sleep. Thus, successfully coping with stress can relieve people from insomnia and/or comorbid depression. Various changes in endocrine system occur during sleep. Long-term stress response is mediated by hypothalamo-pituitary-adrenocortical (HPA) system. Hypothalamus activates sympathetic division of nervous system by releasing corticotropin-releasing hormone (CRH). CRH trigger the secretion of corticotropin (ACTH) from the anterior pituitary gland. Then cortisol is released from the adrenocortex, which may induce rise of blood volume and blood pressure. During the first stage of sleep, growth hormone (GH) is secreted and other hormones (ie. CRH, ACTH, and cortisol hormone) from the HPA system is suppressed . This effect is exactly the opposite o f the effects of stress. resulting in increased SWS and decreased REM sleep . GH will promote protein synthesis and prevents glucose from entering the cells; in this way, more circulating glucose is available in blood to serve as a constant supply to the brain during sleep . 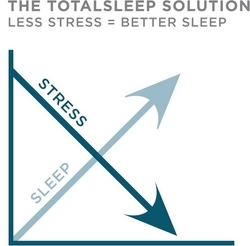 On the other hand, if sleep is prevented, cortisol secretion will increase, creating similar effects as stress . In a study by Steiger, he found out that administration of HPA hormones, CRH production increased, thus reducing SWS and increase in REM sleep during the first part of sleep . Moreover, GH releasing hormone (GHRH) induces GH production and thus increased SWS, while CRH causes the opposite effect . The quality of sleep depends on the balance between GHRH and CRH released. More CRH leads to shallower and more fragmented sleep. And changing in this balance may be also due to depression and aging . Therefore, more stressful people are, more cortisol are released during sleep, causing significant decrease in quality of sleep. While cardiovascular disease is the leading cause of mortality and morbidity in western societies, it is important to understand and apply preventions; sleep, for example, is closely related to it. Back a century ago, people slept an average of 10 hours a night. In recent years, due to increase amount of stressful events, people only sleep on average of 7 hours per day . sleep-deprivation is highly correlated with vascular diseases and high risk of http://en.wikipedia.org/wiki/Hypertension hypertension], as well as mortality (Fig.3). During NREM, heart rate, blood pressure, and cardiac output are all decreased because neural sympathetic activity is decreased. 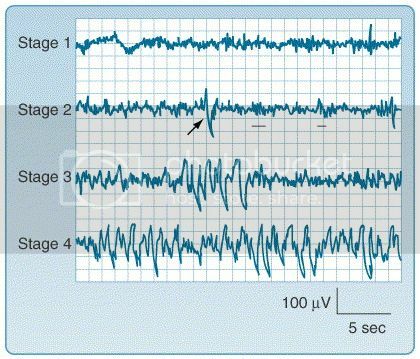 On the contrary, during REM sleep, increased sympathetic activity may cause increase in cardiovascular function . In a prospective study illustrating the relationship between sleep duration and coronary heart disease in women, Najib and others have shown that short-term sleep derivation may increases cortisol levels, sympathetic neural activity, and blood pressure . Long-term sleep-deprivation may impair endothelium-dependent vasodilation in the heart. Moreover, many patients suffering from insufficient sleep are obese or diabetic . Changes in cortisol level due to sleep-deprivation may alter changes in GH production, which may induce diurnal rhythms and plasma levels of leptin. Appetite regulation will also be altered, thus causing obese or diabetes . People become less susceptible to infections and diseases if they have enough sleep . SWS modulates immune system activity and disease processes . In a study evaluating the relationship between sleep and immune system by comparing the amount of sleep get by day workers and shift workers showed that shift workers, who has more sleep loss and high levels of fatigue, tend to have more infections than day workers . This is because the number of immune-cells, such as natural killing cells and other lymphocytes, decreased after sleep-deprivation. 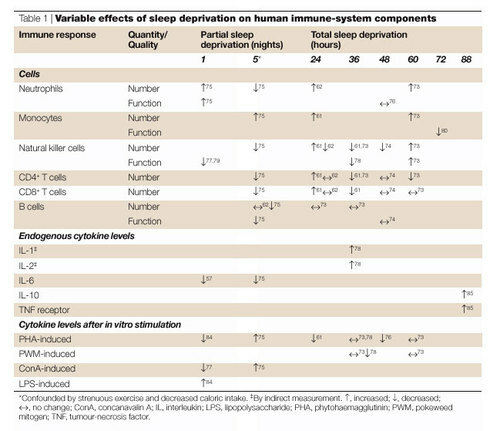 In addition, the number immune cells change according to how long the sleep-deprivation is (Table 1). Furthermore, sleep-deprivation induce the increase of inflammatory cytokines: Interleukin-1ß (IL-1ß), IL-6, and tumor necrosis factor-œ (TNF-œ) . A study done by Vgontzas and others showed that these three cytokines are largely associated with patients who have excessive daytime sleepiness (EDS). Additionally, in a study conducted by Hall and others, they have found that sleep can be a mediator of the stress-immune relationship . The more stressful people are, the lower the number of circulating natural killer cells, and the greater the time spent awake during NREM sleep period. Thus, sleeping well will get people become more immune and less stressful. Adult neurogenesis involves in learning and memory, anxiety regulation, and stress response . Stress decreases proliferation of progenitor cells in the dentate gyrus of hippocampus . This kind of inhibition of cell proliferation is been observed throughout life stages. Glucocorticoids have been indicated as regulating stress-related impairment of adult neurogenesis . Removing circulating adrenal steroids may increase cell proliferation and thus neurogenesis. A similar approach to increase neurogenesis is to inhibit HPA axis activity, since HPA system releases cortisol . Moreover, lack of sleep is stressful and will also reduce hippocampal neurogenesis. From one experiment, it is shown that after chronic sleep-deprivation of 2 weeks, neurogenesis is reduced and circulating glucocorticoids are elevated . However, there is a temporary increase in formation of new neurons if normal sleeping pattern is restored. Therefore, having sufficient sleep is essential in both reducing stress as well as increase adult neurogenesis. 1. Åkerstedt, T. & Perski, A. (2012). Sleep, Stress, and Heart Disease. In Stress and Cardiovascular Disease (pp. 257-272). Sweden: Stockholm. 2. Hall, M. et. al. (1998). Sleep as a Mediator of the Stress-Immune Relationship. Psychosomatic Medicine, 60, 48-51. 3. Carskadon, M.A., Dement, W.C. (2005). Normal Human Sleep: An Overview. In Principles and Practice of Sleep Medicine (pp. 13-23). Philadelphia. 4. Saper, C.B., Chou, T.C., & Scammell, T.E. (2001). The sleep switch: hypothalamic control of sleep and wakefulness. Trends in Neurosciences, 24(12), 726-731. 5. Cernovsky, Z.Z. (1984). Life stress measures and reported frequency of sleep disorders. Percept Mot Skills, 58, 39-49. 6. Adam, K., Tomeny, M., & Oswald, I. (1986). Physiological and psychological differences between good and poor sleepers. J Psychiatr Res. 20, 301-316. 7. Bonnet, M.H., & Arand, D.L. (1998). Heart rate variability in insomniacs and matched normal sleepers. Psychosom Med. 60, 610-615. 8. Gulec, M. et al. (2012). Oxidative stress in patients with primary insomnia. Progress in Neuropsychopharmacology & Biological Psychiatry. 37 (2), 247-251. 9. Morin, C.M., Rodrigue, S., Ivers, H. (2003). Role of stress, arousal, and coping skills in primary insomnia. Psychosom Med. 65, 259-267. 11. Steiger, A. (2002). Sleep and the hypothalamo-pituitary-adrenocortical system. Sleep Med Rev. 6(2), 125-138. 12. Steiger, A. et. al. (1998). Effects of hormones on sleep. Horm Res. 49, 125-130. 13. Spiegel, K., Leproult, R., & Van Cauter, E. (1999). Impact of sleep debt on metabolic and endocrine function. Lancet. 354, 1435-1439. 14. Van Cauter, E. et al. (2004). Reciprocal interactions between the GH axis and sleep. Growth Horm IGF Res.14, 10-17. 15. National Sleep Foundation. (2002). Sleep in America poll. 16. Wolk, R., Gami, A.S., Garcia-Touchard, A., & Somers, V.K. (2005). Sleep and cardiovascular disease. Curr Probl Cardiol. 30(12), 625-662. 17. Ayas, N.T. et.al. (2003). A prospective study of sleep duration and coronary heart disease in women. Arch Intern Med.163, 205-209. 18. Vorona, R.D. et al. (2005). Overweight and obese patients in a primary care population report less sleep than patients with a normal body mass index. Arch Intern Med. 165, 25-30. 19. Sekine, M. et al. (2002). A dose-response relationship between short sleeping hours and childhood obesity: results of the Toyama Birth Cohort Study. Child Care Health Dev. 28,163-70. 20. Bryant, P.A., Trinder, J., & Curtis, N. (2004). Sick and tired: does sleep have a vital role in the immune system. Nat Rev Immunol. 4, 457-467. 21. Mohren, D. C. et al. (2002). Prevalence of common infections among employees in different work schedules. J. Occup. Environ. Med. 44, 1003–1011. 22. Vgontzas, A.N. et. al. (1997). Elevation of plasma cytokines in disorders of excessive daytime sleepiness: role of sleep disturbance and obesity. J Clin Endocrinol Metab. 82(5),1313-1316. 23. Schoenfeld, T. J., & Gould, E. (2012). Stress, stress hormones, and adult neurogenesis. Experimental Neurology. 233, 12-21. 24. Mirescu, C. & Gould, E. (2006). Stress and Adult Neurogenesis. Hippocampus. 16, 233-238. 25. Mirescu, C. Peters, J.D., Noiman, L., & Gould, E. (2006). Sleep deprivation inhibits adult neurogenesis in the hippocampus by elevating glucocorticoids. Proceeding of the National Academy of Science of the United States of America. 103 (50), 19170-19175. Interesting topic, I like the subheadings and how it will be organized. I'm looking forward to reading this when its done! The intro sure sounds like this is going to be a really interesting neurowiki. As a suggestion, I think it would be best if you had one more sentence or so to close out the intro. It seems a bit choppy to end the entire paragraph off with sleep helping in neurogenesis. A sentence to bring everything together would make it an amazing intro! Thank you so much for your advice! I re-read it and yes you are right, it was choppy. I really like your topics! I strongly recommend you to add a video to illustrate one of the subtopics. Keep up the good work! This looks incredibly interesting! Here are some things to also consider: how can one reduce stress before going to sleep? Deep breathing is a great way to reduce stress in order to sleep - it would be great if you could talk about the physiology of deep breathing, its impact on brain centers and how that reduces stress, which in turn, will promote sleep. What diet is ideal to reduce stress/promote sleep? Thank you Sivaniya! I will definitely consider to add this to my topic! umm figure 2 is not showing properly, you might want to fix that! but other than that, i have been always so courious about this topic too. As pressure seems to play an important role on the quality of our sleep and the two form a negative loop influencing each other, it is essential for us to destress through other ways such as exercising and listening to the music during stressful exam period. This topic is fascinating and your neurowiki is very well written! The only suggestions I have would be to generate links with other neurowikis, and to make sure every new piece of information is referenced (it's always better to over-reference just to be safe!). Also, the immune cells are spelt "natural killer cells" rather than "killing". I'm sorry that my comments are late - you did an amazing job! Thanks for your suggestion. Yes I will be linking out my wiki to others, since I am still reading others. And thank you so much for noticing the typo for me, really appreciate your comment! Great neurowiki. I learned a lot. Gonna go to sleep now. :) amazing job! As someone who is stressed because of the lack of sleep, this was a relevant and interesting read. As suggested above the comprehensiveness of your neurowiki would be greatly augmented by generating links to other neurowikis, or even outside sources if you feel that is more appropriate.